A Rup Life was sent a copy for review. This post may contain affiliate links. 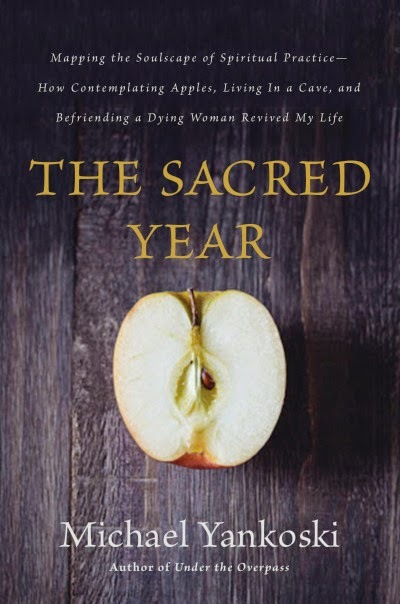 The Sacred Year by Michael Yankoski is my latest book up for review. This book takes a journey with the author after a meeting with a local monk. His life was going fast and he was lost, disenchanted and unfocused. While I was reading this book I kind of had a chuckle to myself. The author spends some time staring at an apple. He looks at it from all angles, checking out the dimples, and bruises. As a Mom, I've done this with each of my babies. Not just once either. Many times in the first year of their lives. Looking at their knuckles and fingernails, the hair on their face... memorizing their littleness. I think maybe perhaps men don't slow down like that in life. This book was interesting. I liked how the author shared personal stories and his thoughts on his spiritual journey. Frustrated and disillusioned with his life as a Christian, motivational speaker Michael Yankoski was determined to stop merely talking about living a life of faith and start experiencing it. The result was a year dedicated to engaging in spiritual practices, both ancient and modern, in a life-altering process that continues to this day. Whether contemplating an apple for an hour before tasting it (attentiveness), eating on $2.00 a day (simplicity) or writing simple letters of thanks (gratitude), Michael discovered a whole new depth through the intentional life. Stirred on by the guiding voice of Father Solomon, a local monk, Yankoski's life is slowly transformed. Both entertaining and heart-wrenching, Yankoski's story will resonate with those who wish to deepen their own committed faith as well as those who are searching --- perhaps for the first time --- for their own authentic encounter with the Divine. Michael Yankoski is a writer, aspiring theologian, and urban homesteader who dreams of becoming a competent woodworker, musician, and sailor. He received his MA in theological studies at Regent College in Vancouver, British Columbia, is a (novitate) Oblate of St. Benedict, and has authored four books. Michael grew up in Colorado, feels at home on the Pacific Coast, and currently resides in Indiana, where he and his wife are pursuing PhDs at the University of Notre Dame.